Practice of current affairs quizzes are the best way to score well in the IAS Prelims Exam. For the convenience of IAS aspirants, we are continuously providing current affairs quizzes. Such current affairs questions are of great help in terms of both IAS Prelims Exam and IAS Mains Exam. Here, in this article, we have compiled the current affairs quizzes created during the whole month. Current affairs regarded as one of the crucial sections of IAS Exam and it requires a continuous practice on daily basis. The IAS Prelims Exam 2017 is going to be held on 18th June 2017 and the IAS aspirant must have better preparation of current affairs. 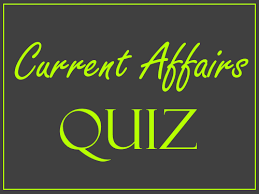 The given current affairs quizzes are based on the recent events of national and international importance. Every question has an elaborated explanation which will help IAS aspirants to prepare for IAS Mains Exam also. In this week we have covered ranges of topics and some of the important topics are- the RASHTRIYA VAYOSHRI YOJANA, the comprehensive scheme PowerTex India, the Worst Forms of Child Labour Convention, the first tiger reserve in India, the mascot Bhoorsingh the Barasingha, the fixation of Nutrient Based Subsidy (NBS) rates, first recycled rocket, the SpaceX’s historic rocket flight, the Chilika lagoon, Aspergillus tubingensis enzyme, The Smart City Mission (SCM), the Indian Institutes of Management Bill 2017, the Mahatma Gandhi Pravasi Suraksha Yojana (MGPSY), the Collaboration Agreement to support the Belmont Forum Secretariat, the Ministry of Culture through National Council of Science Museums (NCSM), the Science Cities Scheme, the Sarin gas attack, Yarn Supply Scheme (YSS), the Green Growth Equity Fund and the Enhancement of Global Competitiveness of Indian Capital Goods Scheme. In this week we have covered ranges of topics and some of the important topics are- Swachhagraha Bapu Ko Karyanjali-A Mission, Confederation of Real Estate Developers’ Associations of India (CREDAI), the Punchhi Committee, the Sewage Treatment Projects, the Wholesale Price Index (WPI) inflation, Swayam, the Nomadic Elephant - 2016, Shodhganga, the Travel and Tourism Competitiveness Index, Vembanad, the Particularly Vulnerable Tribal Groups (PVTGs), the Central Pollution Control Board (CPCB), the State Pollution Control Boards (SPCBs), Blue Revolution, BIMSTEC, the Goods and Services Tax Network (GSTN), Indian Institute of Petroleum and Energy (IIPE), the policy to provide Purchase Preference, the Business Reform Action Plan (BRAP) 2017, the Gender Parity Index, the New Taxi Policy Guidelines and the PSLV. In this week we have covered ranges of topics and some of the important topics are- Anchor investors, the Paika rebellion of 1857, Sagarmatha Friendship 2017, the Second National Lok Adalat for 2017, the Deendayal Antodaya Yojana, the Malabar exercises, the SAUNI Yojana, Khurki and Teenkathiya systems, world’s largest single­site solar power project, the Rewa Ultra Mega Solar Power Project, the HIV and AIDS (Prevention and Control) Bill, the Globalization Backlash' report, the anti-defection law in India, the Rashtriya Uchchatar Shiksha Abhiyan (RUSA), the Indian Navy’s Overseas Deployment (OSD), Pradhan Mantri Garib Kalyan Deposit Scheme, Indian Meteorological Department (IMD), the avoidance of double taxation, the Pro bono legal services, Tele law service, Nyaya Mitra scheme and the National Action Plan to combat Antimicrobial Resistance. In this week we have covered ranges of topics and some of the important topics are- the BRS Conventions, the Rotterdam Convention, Geotagging of MGNREGA, the National Remote Sensing Centre (NRSC), ISRO, the BrahMos Missile, Quality Mark Award Scheme, the firing of BrahMos Land Attack Supersonic Cruise Missile, the Agricultural Marketing and Farmer Friendly Reforms Index, the Digital Payments Movement in India, the BHIM Referral Bonus Scheme, the 48th Dadasaheb Phalke Award, Pradhan Mantri Krishi Sinchai Yojana, NITI Aayog, India’s first underwater metro tunnel, the Government e-Marketplace (GeM), the Goldman Prize 2017, the Atal Pension Yojana (APY), the Spices Farmers Producer Companies (SFPCs), Ude Desh ka Aam Nagrik (UDAN) scheme, scheme for Gramin Dak Sevak, North-east India's largest Information Technology (IT) hub, the Lokpal and Lokayukta, Committee for Programme and Coordination, the Street Lighting National Programme (SLNP), the TB-causing mycobacteria and the process of bio-fortification.